DRG Pneumatic Rotary Actuators can be utilized in many industrial, R&D, lab, and production applications where low precision end stop positioning are acceptable. Typical applications include diverter gates, escapements and ejection stations. These rotary actuators can handle small to medium size payloads up to 1.8 kg (4 lbs) with rotation up to 180° and can be mounted and operated in any direction. 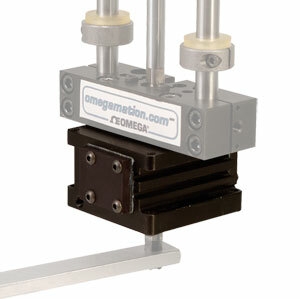 The modular design allows use with DLT Linear Slides and can be operated in any direction. Linear motion pneumatic components are double acting air cylinders that require a dry air supply with filtering to 40 microns or better. For best control of rotary actuators, flow control valves (regulating out) should be installed to regulate the speed of the device. Position sensors can easily be added to motion components to detect the end of travel positions of the slides, they are the standard method of communication with the PLC and are available in inductive or magneto resistive sensing styles and come in both PNP or NPN sourcing signals.